Trellis is an online platform that enables charities and non profits to showcase their impact and raise funds from their donors. Their software allows fundraising professionals and their donors the ability to simply create and manage fundraising event and campaign pages. Capturing the full power of peer to peer, third party and any other type of online fundraising campaigns. We caught up with Justin Goodhew to learn a bit more about Trellis. Justin started Trellis in 2017 with the drive to create more impact in our world by enabling social enterprises. 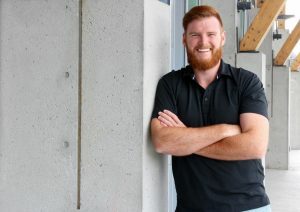 He started in technology by co-founding his own application development company called Biznas Innovations Inc. Biznas built large internal business apps for Fortune 100 companies and smaller B2C apps for startups in Kelowna and Silicon Valley. Name: Trellis Social Enterprise Inc. The Problem: I realized if you work hard and you’re in technology, there’s usually an opportunity for you. I wanted to be in a space where I could make more of a difference, and before I was in technology I did a lot of volunteering and work with community groups. I then got into technology and learned a lot, but realized you have to love what you start a business in. The social enterprise space, the purpose space, is where I want to be because it allows me to keep going that extra distance. Focussing on having purpose over profit really allows me to do that. There wasn’t a specific problem I was trying to solve, it was ‘I really enjoy technology, I think technology can help this space and the people trying to do more than just make money.’ I wanted to have something more purposeful, and I think helping people within charities and non-profits is very purposeful. The Solution: Our mission is to empower organizations in the social sector to create more impact in their communities. Trellis is helping move the non-profit and charity sector into the future of sustainable social development by fostering social enterprise, sustainable development and impact focused work. In five to ten years I really hope Trellis is enabling impact and not just enabling donations. Donations are one way to make an impact, and I think it always will be. But if I can get charities to identify and define their impact, I can try and move these organizations forward into more of a social enterprise rather than a pure charitable model. There’s a lot happening in the space, so we’re trying to build a platform to help facilitate that. Accomplishments: We’ve had a lot of validation from local organizations but also across Canada. We went to the Association for Healthcare Philanthropy conference in Ottawa and got really good feedback and interest – we’re just not ready yet. We’re at a crucial point where we need to keep on building an exceptional product, but I think the market’s there. The online donation space is growing rapidly because every year more and more people are choosing to donate online. Next Steps: We need to get our product out. I think we can build an exceptional experience on the product side. We’ve hit some hurdles and we’ve done a lot of learning so far, and I think that’s only going to make the product stronger once it’s released. The technology isn’t groundbreaking, but it’s not something you can build up in a day. Our team is focused on launching something that we can be proud of and that charities can really build their platform on. What We Need Help With: We always need people to look through our prototypes. We have a prototype built out, and we need people to click through that are in the space. Getting feedback is always great. We’ve got a ton already – it’s been amazing and that’s what’s informed our whole build. To learn more about Trellis, connect with Justin. ← Let’s Move the Dial. For Real.